Last year the National Yiddish Theatre Folksbiene (NYTF) presented KulturfestNYC, the international festival of Jewish performing arts that attracted more than 50,000 attendees in one week. This year the festival returns for three months, from June 6 to August 29. With over three-dozen separate events in venues across the city, the summer-long festival welcomes artists and groups from France, Romania, Japan, Israel, Russia and the U.S. The Festival's eclectic programming includes concerts at SummerStage in Central Park; City Winery; Joe's Pub at The Public; the Robert F. Wagner Park in Lower Manhattan, and The Paper Box in Brooklyn. The theatre events take place at the Baruch Performing Arts Center, and the Museum of Jewish Heritage, 36 Battery Park Place, which is the Festival's headquarters. A number of outdoor and family cultural events -- including a street fair, music brunches, singalongs and barbecues -- are also scheduled throughout the Festival, emphasizing cross-cultural and cross-generational audience engagement. The festival kicks off on Wednesday evening, June15 at 7pm at SummerStage in Central Park. The free program will be the return of "Yiddish Soul" -- this year featuring the internationally acclaimed Dudu Fisher. A remarkable concert blending Eastern European and American music, "Yiddish Soul" will bring together an eye-popping minion of cantorial and Chassidic superstars, including Netanel Hershtik, Yanky Lemmer, The Maccabeats, Joseph Malovany, Lipa Schmeltzer and Zusha. 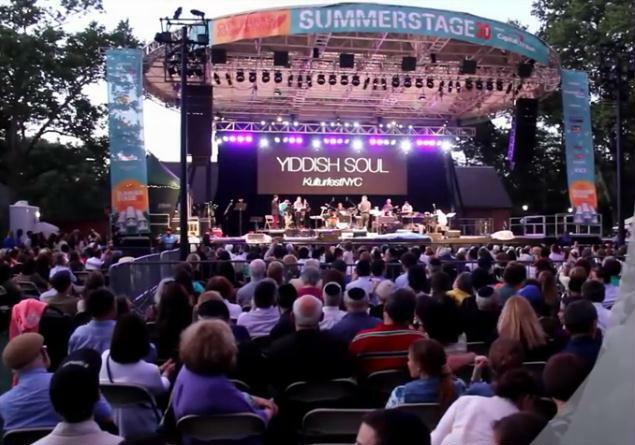 Here's a sample of the 2015 Yiddish Soul program.